This week is somehow turning into a "tips" week, which wasn't planned. 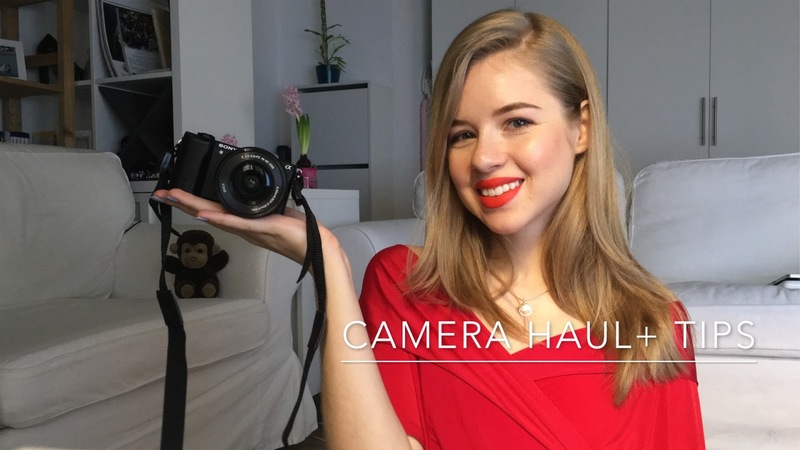 However, today I'm sharing 5 tips for choosing a new camera together with an unboxing video. I was on the hunt for new camera for half a year now, looking a different brands and models. Finally finding the perfect option to use for my blog, Youtube channel and personal life. Hope you enjoy the video! Please subscribe! It will make my day! My new camera is a Sony Alpha 5100, which I've been lustig over about half year. It has 24.3 megapixels and an ISO up to 25600, Wifi and films 1080HD, let's not forget the flip screen. All these features made it perfect for me. The high quality pictures and videos it creates, makes it suitable to use for both my blog and Youtube, all while being super compact and east to take around. 1. First thing I would suggest, is to go look around and find out what you want. Looking online or going in a store, as you wish. You could find out about new models or just a brand you didn't know. 2. You have to be very sincere with yourself and think about what you actually need. These first two points don't always give the same result. If you're not a photographer, blogger or Youtuber you might not need to invest in a DSLR, so take your time and think this through. 3. Research! No matter what I, other bloggers or the store employer tell you, you need to do your own research and a lot of it. When investing in a camera it's best to make the most informed decision possible. We have different needs and wishes from cameras, so you need to make sure the camera you end up buying, will fulfill them all. 4. Visit the store multiple times to get a real feel of the camera. Hold it from different angles, inspect it, ask about the features that interest you, prices on the camera and additional lenses. This will help you be sure about your decision and also help you not to make an impulse buy. If every time you see it and hold it, you are more in love with it, then it's the one for you. If you start getting bored by just seeing it a few times, maybe you should reconsider. 5. Finally, take in consideration your lifestyle. Do you travel a lot, who takes your pictures, when will you be using it, how likely are you to take it around? If you travel a lot or are a vlogger, a huge DSLR is quite annoying to carry everywhere, so maybe you should look into compact DSLR's. If you already have a vlogging/travel camera and you want something more professional, then look into DSLR's. Really analyze what you're most likely to use! Personally getting a huge camera wouldn't have been a smart decision, because I would never vlog with it and would refuse to carry it on vacation half the time. Hopefully some of these tips were helpful! Such great camera buying tips! I've been dying to get a new camera, but it's such a stressful decision process. This one looks so great for travel! That's really nice, to have such a great camera! I liked your tips and especially number 5. It's true, a big camera is a burden to carry around, and I managed to find one that people sometimes laugh when I show, but after they see the pictures, all are in love :) Small and practical! Hope you have a lovely day! Sua nova câmera parece ótima! I loveee that camera, enjoy it!! I'm happy because you have new camera! Now, your photos will be more beautiful than ever. Yay! Congrats on your new camera! It's sounds lovely. I just got a new camera too, so I definitely know that feeling haha. I'm loving these tips! Especially since I will be on the market for a new camera really soon. Thanks for sharing doll. Congrats on your new camera, can't believe it's 24.3 megapixels and an ISO up to 25600. It's a steal. The new camera looks and shoots amazingly babe! Thank so much for sharing those great tips hun :) Hope you have an amazing weekend! Amazing post, great tips too, I love your blog, love your video too. Thank you for sharing, you look stunning!!! I need to get a new camera asap!